The lively Milky Holmes girl, who’d rather use brawn over brains! From the anime with a second season on the way, ‘Tantei Opera Milky Holmes’ comes another Nendoroid to join the Milky Holmes family! – Nendoroid Nero Yuzurizaki! She includes three different expressions, as well as the metal rod she uses when using her toys ability, an ‘Umauma Stick’ treat for her to munch on and even the flying machine that was seen in the last episode of the first season. She also comes with extra parts to recreate the way she looked in episode 9 – after she was possessed by her ancestor, Nero Wolfe. 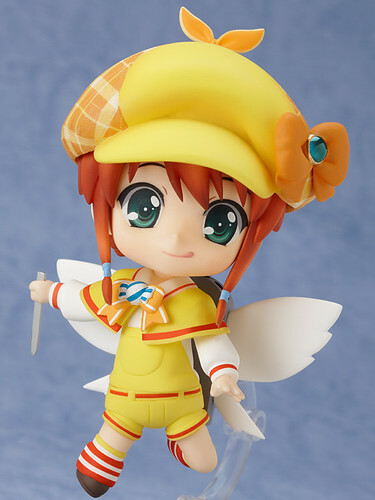 She is going to be released on April 2012 with the usual price tag of 3500 Yen.